In this issue we get an updated telling of Captain America’s origin, first told in his very first comic, Captain America Comics #1, and retold more recently in Tales of Suspense #63. This time around, we get several new details that are considered essential to the origin, such as the Vita-Rays that, along with the super-soldier serum, comprise the treatment in Project Rebirth (here called Project Super-Soldier), as well as the scene, well-known from the film Captain America: The First Avenger, of a spindly young Steve Rogers being rejected by the Army before being chosen for the super-soldier program. After Steve is taken to the lab and injected with the super-soldier serum, the final step is the Vita-Rays—administered with a healthy dose of Kirby Krackle! Below, we learn that the treatment was designed not just to create super-soldiers, but to benefit the health of all humanity, and an affirmation that it did not make Steve super-human but “merely” a near-perfect human specimen; this keeps with the description, seen many times to this point, of Captain America having “no super-powers.” More important for our purposes, Dr. Erskine—operating here under the codename Dr. Reinstein—emphasizes the importance of good character (“sound mind”) as well as a sound body in embodying this ideal person. Erskine effectively gives Steve his mission as he dies in the younger man’s arms (although I doubt Steve needed to be told). Below, he shows that he heard and understood. During Steve’s battle with Erskine’s killer, he see him proclaim about fascists’ underestimation of the people they hope to subjugate, and also openly accept his fate as the sentinel of liberty (which he comes to resent after being reborn in a different way in the 1960s). 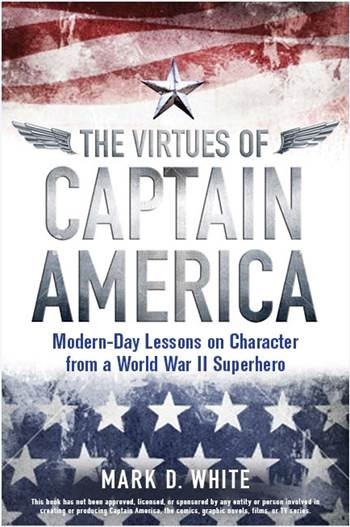 After he finishes his tale with the familiar story of Bucky stumbling upon Cap’s secret, Nick gets all sensitive—and Cap doubles up on being morose. Stay tuned for Captain America #255, when we’ll get an even more elaborate version of Cap’s origin, courtesy of Roger Stern and John Byrne.